A street artist from Whitstable, Kent, UK, that calls himself Catman paints over some local art. 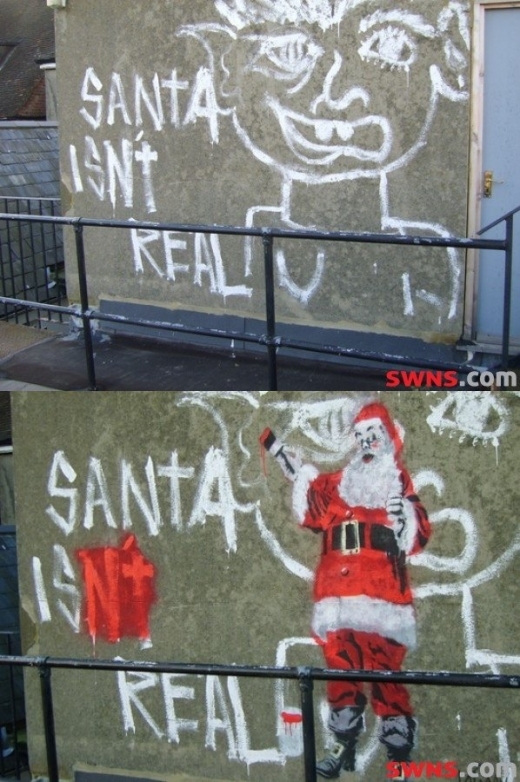 The Christmas cartoon has been welcomed by local councillors, who are usually harsh critics of all graffiti. Cllr John Wratten said: "The original has been there for a long time so I guess it needed updating and it has been done tastefully, with typical Whitstable good humour. The colourful depiction of St Nick appeared next to the original graffiti last weekend, when it is believed the artist painted it overnight. Other pictures believed to have been the work of Catman have appeared across the town, including pictures of Marilyn Monroe on traffic bollards.